This year's Oscar ceremony won't go down in history as one of the most surprising ever - perhaps a good thing after last year's best picture mix-up. Most of the people who were expected to win awards won them, while the awards were evenly distributed between the main films in contention. And despite references to #MeToo and Harvey Weinstein, it didn't feel as political as the Golden Globes with its red carpet black-out. So what actually is an inclusion rider? Some people get Oscars for their first film. But for some, it takes longer - quite a bit longer, in fact. On Sunday we saw James Ivory win his very first Oscar, for adapted screenplay, for the gorgeous yet heartbreaking coming-of-age romance Call Me By Your Name. At 89, he's the oldest person to ever take home one of the coveted gold statues - and it sounds like it was worth the wait. He told the press room: "I mean, being 90 years for anything that you would do is extraordinary. "But to be here having won the Oscar at that age, this seems like a hiccup in nature. But it feels great." Then we had British cinematographer Roger Deakins, finally winning an Oscar after being nominated a stonking 14 times. In the end, it was his work on Blade Runner 2049 that earned him the award. It was actually Allison Janney's first Oscars, and her first win - something she once thought was simply not going to happen for her. "I didn't dare to dream of things like this, because I didn't want to be disappointed," she said. "At a certain point, I'd given up on something like this happening to me." And while Jordan Peele won the Oscar for best original screenplay for Get Out, he had quit writing it 20 times. Yes, 20 times. But he persevered. The message there? Don't give up and dare to dream. This year's Oscars may have been devoid of the drama that categorised last year - possibly thanks to a larger font being used on the envelopes. Neither was it a politically-charged year for the Academy Awards, with no #OscarsSoWhite this time around. But it did feel like there was a change in the air: a sense of new kinds of films being recognised, made by people who might have previously been passed over by the Oscars. That's quite likely due to the change in the make-up of the voting Academy in recent years. Jordan Peele put it well by saying there was a "renaissance" in film. It was like a baton was being passed too, when Gary Oldman paid tribute to the skills of fellow best actor nominee Timothee Chalamet - telling the young actor he'd be back and that his time for an Oscar would come. Meanwhile, The Shape of Water director Guillermo del Toro offered a challenge to aspiring film-makers. "I want to tell you - everyone who is dreaming of… using genre or fantasy to tell stories about the things that are real in the world today, you can do it," he said as he picked up the award for best picture. "This is a door - kick it open and come in." That line came from the inspiring speech given by Lee Unkrich, producer of Disney/Pixar's charming Day of the Dead animation Coco. He said his biggest thanks went to Mexico, and that the film could not have existed without its "endlessly beautiful culture and traditions". "With Coco, we tried to take a step forward toward a world where all children can grow up seeing characters in movies that look and talk and live like they do," he told the audience. "Marginalised people deserve to feel like they belong. Representation matters." It was an Oscars where representation seemed to matter, more than perhaps ever before. It was on stage in the form of Daniela Vega, the first transgender actress to present. (The film she stars in, A Fantastic Woman, also won best foreign film.) 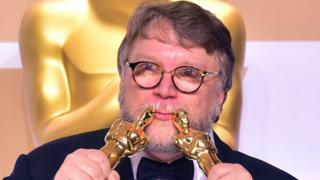 And it was present when del Toro won best director and best picture. Frances McDormand made a point of forcing the Oscars to stare representation in the face by asking female nominees to stand up. And Rachel Shenton and Chris Overton spoke of the importance of their short film, The Silent Child, in representing deafness. There's still a long way to go, with only one woman having won a best director Oscar - an award that's yet to go to a black director. But it feels like a start. It might seem like the stuff of dreams - or of nightmares, depending on how you feel about hot dogs. But giant plastic hot dog cannons that you fire actual hot dogs out of are real, they exist, and they formed a key part of a skit during the Oscars show. Jimmy Kimmel got celebrities including Gal Gadot, Margot Robbie and Emily Blunt to take a quick trip across the road to a nearby cinema, where an unsuspecting audience were watching a preview of A Wrinkle in Time. There they provided snacks to the surprised members of the public. But the highlight was surely Armie Hammer and Ansel Elgort armed with hot dog cannons. "This is better than the Oscars!" Gadot exclaimed. In addition to being showered with hot dogs, host Jimmy Kimmel surprised the audience at the Dolby Theatre with snack boxes full of crisps, Gummy bears, chocolate, granola bars and - thoughtfully - Listerine strips. "It wouldn't be right to make you sit through this without snacks," a note inside the boxes read, adding: "Please don't throw them at me." The boxes were themed around the best picture nominations and contained original artwork portraying each film. Additionally, a donation to the LA Regional Food Bank was made for each box.